2016 has earned the title of being a difficult year. Luckily, 2016 wasn’t all bad, especially when it comes to coworking. As the movement matures, we see the the annual growth rate slowing down, which is a sign of the industry now focusing on fine tuning and improvement, rather than responding to the excitement of the trend, like in previous years. Recently, Deskmag’s annual Global Coworking Survey, in collaboration with Socialworkplaces, was presented last month at Coworking Europe in Brussels. We now bring you the full results of the survey. Last year, the coworking industry boasted an increase in stability after facing less than perfect conditions in 2015. We also saw substantial growth in regards to the number of spaces worldwide, approximately 11,300 coworking spaces with 835,000 members. The 2017 Global coworking Survey predicts that there will be an estimated 13,800 active coworking spaces worldwide. An additional 2,500 to be exact. The 2017 survey projects that from these additional spaces the amount of coworking members around the world will increase to slightly over 1 million members. The predicted number, 1,180,000 will show an increase of about 41 % from last years 64%. One of the major questions as the movement progresses is: How do coworking spaces define themselves? 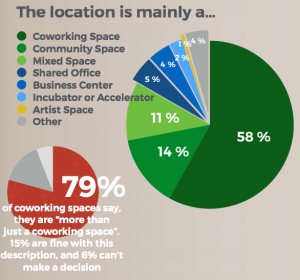 Well about 79% of spaces say that they are “more than just a coworking space”, while 15% sit comfortably as coworking spaces, and a slight 6% remain undecided. The central elements that make a space more than simply a coworking space is the addition of events, business accelerators and coffee shops. One thing that seems to remain relatively stable is the informal element of coworking that we all know and love. Around 60% of spaces were self-described as “casual”. How sustainable is coworking today? One thing that has certainly increased in profitability. Compared to all previous years, coworking spaces around the world are at their most profitable, at 41% a little step above 36% in 2015. When it comes to sustaining staff and operations, 44% of staff feel that their compensation is “rather good”, while operators and founders are only at 20%. Of course, these spaces are often a labor of love so it can take time to turn a profit. Hopefully 2017 will bring in the money for these hard working space operators. When it comes to bringing in new members, the majority of coworking spaces, 80%, site social media, specifically Facebook, and online presence as the biggest attractor. Coming in at a close second at 78% was community building, followed by events, free trials, with coworking associations coming in last. For many current and future operators this types is extremely important as it can help them increase their network and become more sustainable in the future. As the movement advances, we even know which SEO keywords can help build your online presence, most often in combination, such as “shared space” or “coworking space”. How have coworking members evolved? It’s heartwarming to see that coworking still remains open. While there will always be coworkers who require more privacy, or a team office, 75% of coworkers still work in open and flexible areas. This was only a 2% decrease from a reported 77% in 2015/2016. In order to ensure a healthy and comfortable workspace, operators and management can gather important insight from the survey to better suit their member’s needs. For example, the majority of coworkers use basic office furniture, but more than half ( around 76% ) of coworkers would like to sit in an ergonomic office chair. When it comes to collaboration, we still see similar numbers as we did in 2015/2016, yet with a little less communication. 55 % percent of coworkers said that they work on their own primarily, which is a slight decrease from previous years. This could be due to the fact that more coworking spaces now present themselves to a wider variety of professionals, such as corporate employees, who may or may not have time or interest when it comes to the social side of coworking. In terms of collaboration between members, 71% of participants said that they have collaborated with other members within the last 12 months, at an average of 4 collaborations. Today the majority of members have found out about their coworking space via word of mouth, followed closely by internet searches and company/ client recommendations. Based on member ratings, spaces earned 8,17 out of 10, which was an increase from last year’s 8,3. In addition to high ratings, there was also an increase in the amount of hours members used their coworking space. 71% of survey participants claimed to have worked at their coworking space three times a week, or more, while 41% use their space every day. When it comes to payments. 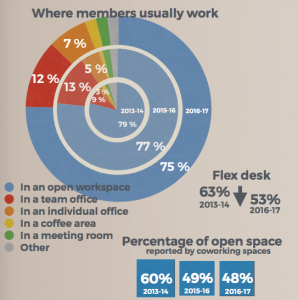 The majority of members, 61%, pay for their coworking space memberships themselves. 26% of memberships are paid for by an employer, which could increase in the near future as more companies allow their employees to work remotely. What does coworking in 2017 look like? Just a few days away from ringing in the new year, we are once again opening ourselves up to new resolutions. Last year, 62% of coworking spaces planned for at least one additional expansion, which has gone up to 67% in 2017 projections. 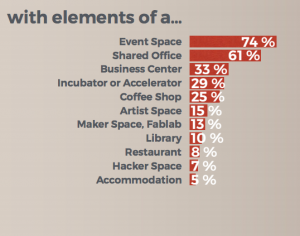 42% of those spaces are planning to open an additional location, while 25% plan to expand within their current space. As for people power, 85% of spaces believe there will be in an increase in members, which came in slightly lower when compared to previous years. In terms of income flow within the space, around 78% of spaces believe there will be an increase in income, which was also down 4% from 2015/2016. Overall, coworking has matured over the last decade and today we see the movement as well beyond a fad as it becomes a standard of workplace inspiration. So this year, as you plan to spend less time on your phone, or lose weight, don’t forget to invest time in your coworking community! Download your own copy of the survey here!